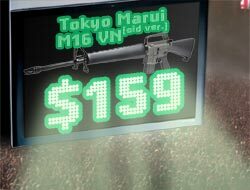 Used in Vietnam, the M16-VN is similar to the M16-A1 with the exception of a large capacity straight magazine, a forked flash hider, and an EG700 motor. Metal 3-prong flash hider screws off to reveal counter-clockwise 14mm thread for attachment of silencer (sold separately). Comes standard with a metal 190 round hi-capacity removable magazine. Fixed stock accomodates large 8.4v battery for longer play. A legendary rifle from the US vietnam era. We have a very limited supply of this older version in stock that we found sitting in an old dusty warehouse in Japan. This older version sports slightly different packaging. Given that these have been sitting around for some time, the boxes are a little dusty and not in mint condition. The guns are factory original and brand new. All come with original manuals. We have tested them and re-lubricated them to ensure they are in perfect working condition despite their years of not seeing any action. This is your chance to bring them to life and show them the action they deserve. This incredible offer only applies to retail buyers. Offer valid only while stocks last! Act Now!